The Napa Valley Wine Train Has Partnered with Napa Valley Vine Trail and Local Arts Community to Create Rail Arts District (RAD) Napa. When you ride the Napa Valley Wine Train, a $1 donation to RAD will be added to your check for each guest. This generous contribution is greatly appreciated as we continue the development of the Rail Arts District (RAD) Napa. Please let your server know if you would like to opt-out of this contribution program prior to ringing up your ticket. With an initial fund of $100,000 contributed by the Napa Valley Wine Train and Napa Valley Vine Trail, RAD Napa is improving the “Cross Town Commuter Path” in the heart of downtown Napa by adding a variety of murals, sculptures, landscaping and the Napa Community Quake Mosaic beginning in February 2017. 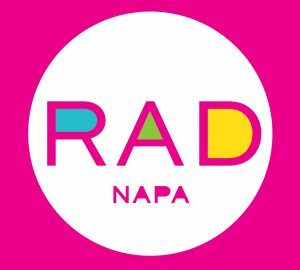 RAD Napa at [email protected], call the Napa Valley Vine Trail at (707) 252-3547, extension 500 or visit http://www.radnapa.org. Please be aware that our efforts are ongoing. If, at any time, you have specific questions or concerns about the accessibility of any particular webpage on www.winetrain.com or any of our other destination websites, please contact us at access[email protected]. If you encounter an accessibility issue, please be sure to specify the particular web page in your email, and we will make all reasonable efforts to make that page accessible for you.